My little Peanut’s 1st birthday is coming up in less than a month. Okay, technically it’s her second if you count the day she was born, but she’s turning 1 year old. And she’s still my BABY, so it’s her 1st birthday in my book. And with a birthday comes a birthday bash and the opportunity to make an adorable cake in her honor! Making a cake from scratch has become one of the birthday traditions in our house. Every year for my husband’s birthday I make him a layered carrot cake. It’s vegan, but I’m not sure he actually knows that. I like to take every opportunity I can to sneak healthy stuff into traditionally tasty-but-not-so-good-for-you foods. So recently I’ve been thinking about how to make Peanut Girl’s cake cute and frilly and yummy but without loads of sugar. In the last year it’s become more important to me than ever before that my family eat a healthy diet (although I cannot be held responsible for everything my husband eats) and I’m not going to throw that mindset out the window for one cake on one day. Birthday or not! 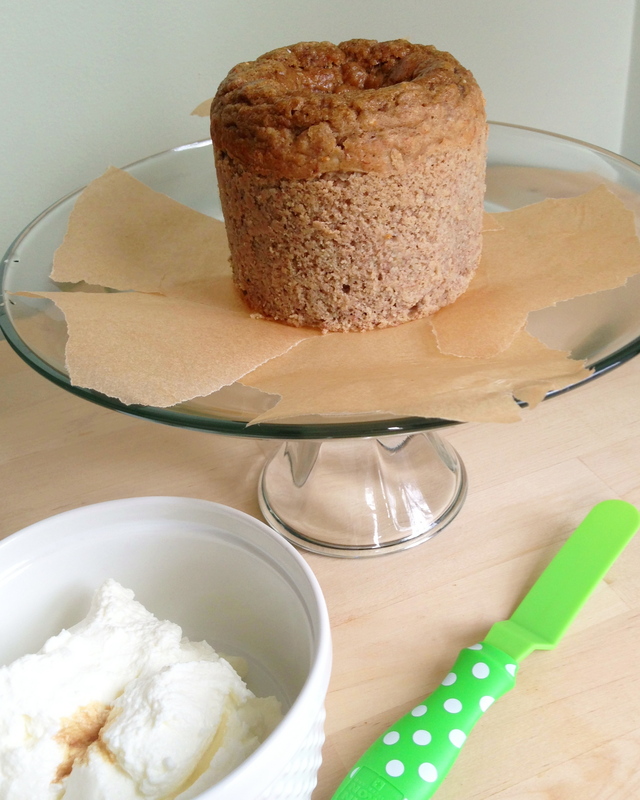 So, I created this banana cake recipe very loosely off one I found at wholesomebabyfood.com. The cake below has no sugar though. Instead it’s sweetened by bananas and applesauce. It would be hard to make this cake wrong. And the frosting could not be easier. It’s greek yogurt, plain and simple. Honestly, I would challenge anyone to make a more simple frosting. Not possible. One ingredient! And Peanut cannot get enough yogurt. It’s currently her favorite food. Basically she gets to eat her favorite food and it comes with the bonus of a banana cake underneath. Her lucky day! So, here’s the cake and frosting. Take your own liberties and tell me about it in the comments. Happy birthday to your little ones! And Happy Noshing! You’ll make the whole cake in just one bowl (hurray! ), so find one that’s medium-large sized. Put the coconut oil in the bowl and microwave just until melted, about 40 seconds. Mash in the bananas with a fork. Add the vanilla, cinnamon, egg and applesauce and mix until blended. Add baking soda and flour and stir to mix. 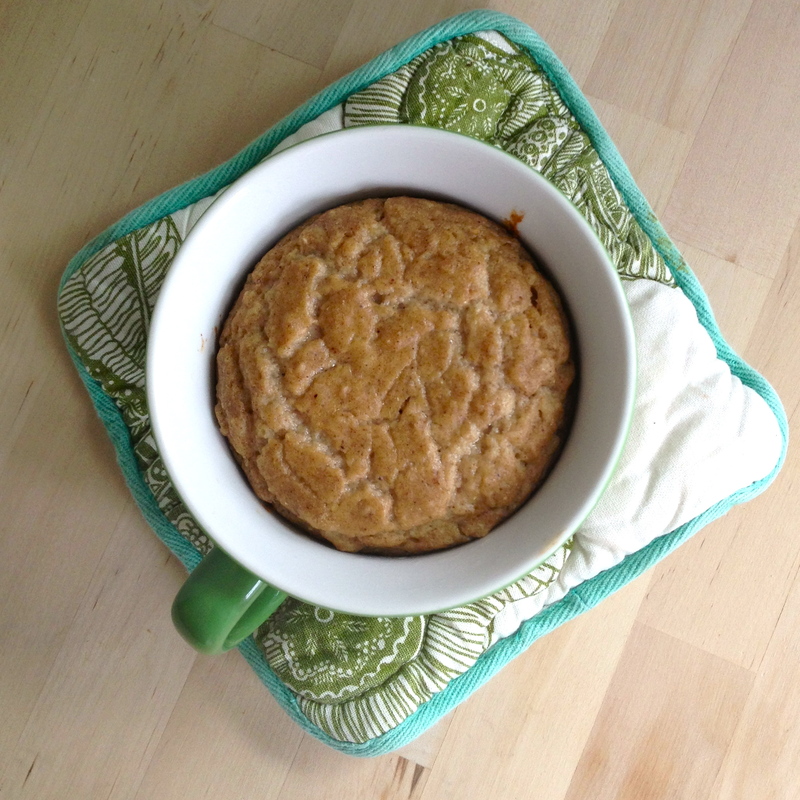 Line a small round baking dish or ramekin with coconut oil. I used this Corningware mug that I also make oatmeal in and it worked perfectly. Bake for 36-40 minutes in a 350 degree oven. Make sure the cake is fully baked or it will be a huge puddle in the middle (and not in a good way). Let it cool and run a knife around the edge before flipping over and tapping the bottom. It should slide out easily after a few good taps. This is the easiest frosting in the world. Use plain whole milk greek yogurt, it should be a brand that’s pretty thick in order to hold it’s shape on the cake. I use The Greek Gods or Fage would also be good. Place the cake in the middle of a platter or small plate, whatever you want to use for the final presentation. Tear 4″x4″ish pieces of tin foil or parchment paper which will be used as a work surface so you don’t have to clean up the plate after. Slide them under the cake so they’re just barely under the outside edges of cake but covering the plate. Then, after you frost, you can slide them out with all the excess frosting and your plate underneath will be perfectly clean. This cake should be stored in the fridge until you’re ready to eat it because it contains eggs and yogurt. It would be the worst if the yogurt melted off the cake. So, maybe put it in an air conditioned car (or your trunk if you live in MN like me) if you’re taking it somewhere. To make 1 dozen cupcakes, use the adjustments below. These will be smallish cupcakes, perfect for little hands and stomachs! Bake 18-25 minutes. The cupcakes should be set when you jiggle the pan and spring back if you lightly touch the tops. * It’s a little harder to find organic unsweetened applesauce, but I think it’s worth it. If you’re trying to avoid giving your little one sugar, it defeats the purpose to use applesauce that has some strange sweetener. ***It’s best to use a mix of flours to keep the cake light. I used a mix of gluten free flours – teff, sorghum and oats ground into a flour (in the coffee grinder). You can also use whole wheat, quinoa flour, almond meal, raw coconut flour (you may need to add water if using coconut). Please leave a comment and let me know what worked…or didn’t. This may be our 1 year bday cake as well! I’d love to see a photo or let me know if you make modifications. If you use sprinkles, be sure to put them on the day of. I realized the second day, the dye had started to spread onto the yogurt. I made the small cupcakes. They turned out great. I used oat and almond flours (half of each) and cooked a little longer then noted. They also needed some time to set/cool to help so they weren’t mushy inside. My 3 year old and one year old ate them up!!! Yum!!! 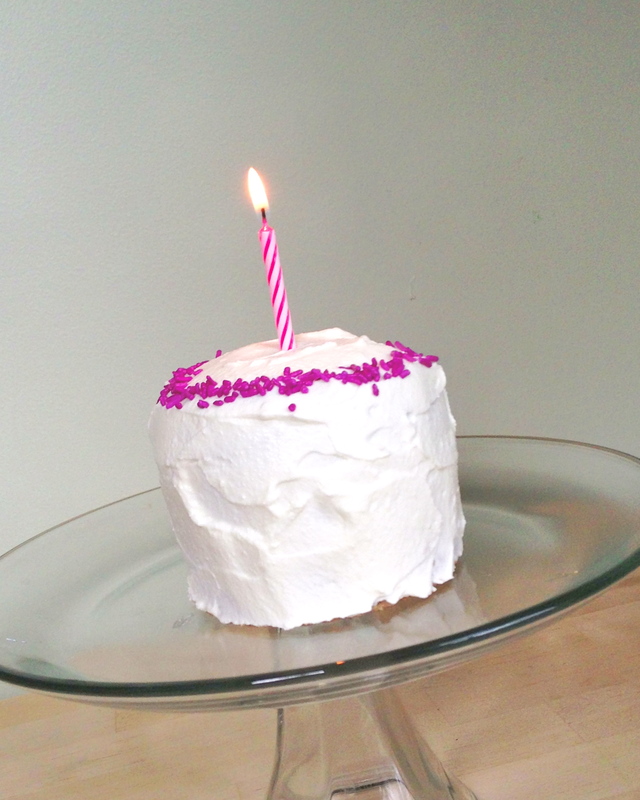 Made this for my own small birthday cake this year and it was wonderful. I added a touch of cinnamon, nutmeg, and a few walnuts just for my taste. 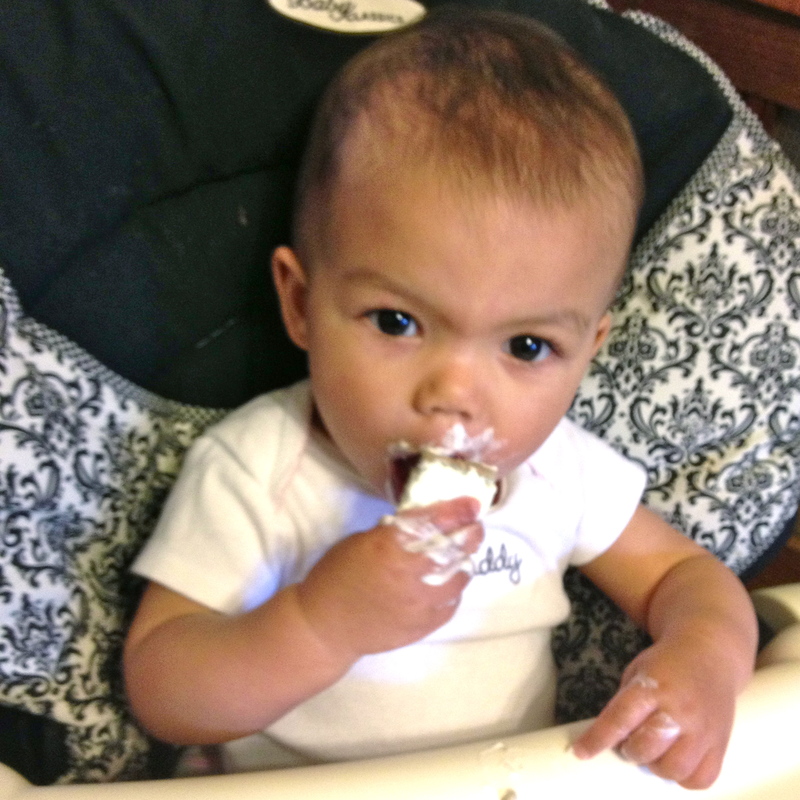 I was so excited to find a sugar free cake recipe on your website as I am 7 months pregnant and didn’t want to start my baby’s life in utero with lots of sugar and fake flavorings. Thank you so much for sharing!